Grace Nichols was born and educated in Guyana. She came to Britain in 1977 and since then has written many books for both adults and children. Her first poetry collection, i is a long-memoried woman, won the 1983 Commonwealth Poetry Prize and was later dramatised for radio and made into a film which received a gold medal in the International Film and Television Festival in New York. 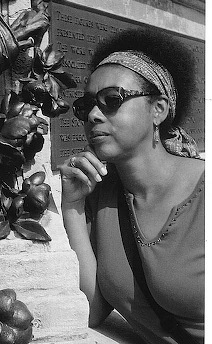 Her other adult poetry collections include the ever-popular The Fat Black Woman’s Poems (1984); Lazy Thoughts of A Lazy Woman (1989); Sunris (1996), which was winner of the Guyana Poetry Prize; and Startling The Flying Fish (2006); all published by Virago, who also published her first novel - set in Guyana; Whole Of A Morning Sky. Her most recent poetry collections are Picasso, I Want My Face Back (2009), partly inspired by her residency at the Tate Gallery, London, I Have Crossed An Ocean - selected poems; and The Insomnia Poems (2017), published by Bloodaxe Books. Among Grace’s children’s books are two collections of short stories; Trust You Wriggly and Lesley in London, as well as poetry books such as Come On Into My Tropical Garden; The Poet Cat; Everybody Got A Gift and Paint Me A Poem, which was awarded the Poetry Book Society prize for the Best Children's Author collection. Her latest book of poems for young people, Cosmic Disco, was published by Frances-Lincoln in 2013. She has also edited several anthologies, some with her husband, the poet John Agard. These include: A Caribbean Dozen; Under The Moon and Over The Sea (which won a CLPE award) and more recently Pumpkin Grumpkin, a collection of nonsense poems from around the world (Walker Books). Grace Nichols received a Cholmondeley Award in 2001 and more recently an Honorary Doctorate from the University of Hull. She is among the poets on the current GCSE syllabus and performs her work widely around Britain. She is a fellow of The Royal Society Of Literature. During Grace’s year as poet-in-residence at the Tate Gallery, London (1999 - 2000), she began to write a series of poems inspired by Picasso's iconic Weeping Woman painting, which eventually lead to Crosspath's multimedia production, Dora vs Picasso.